Basil was the son of Emperor Romanos II by Theophano. In 960, he was associated on the throne by his father, but the latter died in 963, when Basil was only five years old. Because he and his brother, the future Emperor Constantine VIII (ruled 1025 - 1028), were too young to reign in their own right, Basil's mother Theophano married one of Romanos' leading generals, who took the throne as the Emperor Nikephoros II Phokas several months later in 963. Nikephoros was murdered in 969, only to be succeeded by another general, who became Emperor John I Tzimisces and reigned for seven years. 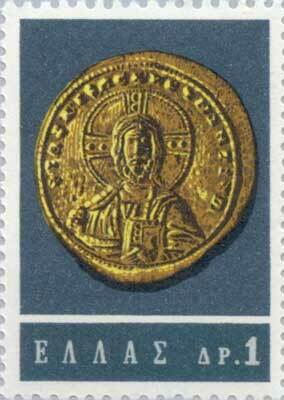 Finally, when John died on January 10, 976, Basil II took the throne as senior emperor. Although Nikephoros II Phokas in particular had proven to be a brilliant military commander during his reign, both he and John I Tzimiskes had proven to be lax administrators. As a result of this, Basil found himself with a serious problem as soon as his reign began. The great landowners of Asia Minor who provided many of the empire's soldiers and taxes – Bardas Skleros and Bardas Phokas – were in open revolt against the empire. Basil, showing the penchant for ruthlessness that would become his trademark, took the field himself and suppressed the rebellions of both Skleros (979) and Phokas (989). To do so Basil formed an alliance with Prince Vladimir I of Kiev, who had captured the main imperial base in the Crimea, Chersonesos, in 988. Vladimir offered to evacuate Chersonesos and to supply 6,000 men of his army as reinforcements to Basil. In exchange Vladimir demanded to be married to Basil's younger sister Anna (963–1011). At first, Basil hesitated. The Byzantines viewed all the nations of Northern Europe, be they Franks or Russians, as barbarians. Anna herself objected to marrying a barbarian ruler, as such a marriage would have no precedents in imperial annals. But when Vladimir promised to baptize himself and to convert his people to Christianity, Basil finally agreed. Vladimir and Anna were married in the Crimea in 989. The Rus' recruitments were instrumental in ending the rebellion, and they were later organized into the Varangian Guard. The fall of Basil Lekapenos followed the rebellions. He was accused of plotting with the rebels and punished with exile and the confiscation of his enormous property. Seeking to protect the lower and middle classes, Basil II made ruthless war upon the system of immense estates which had grown up, in Asia Minor and which his predecessor, Romanos I, had endeavoured to check. 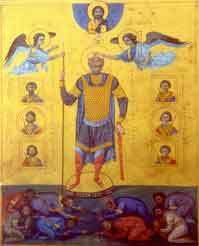 Having put an end to the internal strife, Basil II then turned his attention to the empire's other enemies. The Byzantine civil wars had weakened the empire's position in the east and the gains of Nikephoros II Phokas and John I Tzimiskes came close to being lost, with Aleppo besieged and Antioch threatened by the enemy. In the 995, Basil II launched a campaign against the Muslim Arabs and won several battles in Syria, relieving Aleppo, taking over the Orontes valley, and raiding further south. Although he did not have the force to drive into Palestine and reclaim Jerusalem, his victories did restore much of Syria to the empire. No emperor since Heraclius had been able to hold these lands for any length of time, and they would remain Byzantine for the next 75 years. However, Basil was far from done. He wanted to restore to the empire territories that had long slipped from its grasp. As the second millennium got under way, he took on his greatest adversary, Samuel of Bulgaria. Bulgaria had been partly subjugated by John I Tzimiskes, but parts of the country had remained outside Byzantine control, under the leadership of Samuel and his brothers. As they raded into Byzantine lands from 976, the Byzantine government sought to cause dissention by first allowing the escape of the captive Bulgarian emperor Boris II. This having failed, Basil II used a respite from his conflict with the nobility to lead an expedition into Bulgaria and besiege Sredets (Sofia) in 986. Taking losses and worried about the loyalty of some of his governors, Basil lifted the siege and back headed for Thrace but fell into an ambush and suffered a serious defeat at Trajan's Gate on August 17, 986. Basil escaped with the help of his Varangian Guard and attempted to make up his losses by turning Samuel's brother Aron against him. Aron was tempted with Basil's offer of his own sister Anna in marriage, but the negotiations failed when Aron discovered that the bride he was sent was a fake. By 987 Aron had been eliminated by Samuel, and Basil was busy fighting both Skleros and Phokas in Asia Minor. Although the titular Bulgarian emperor Roman was captured in 991, Basil lost Moesia to the Bulgarians. From 1000, Basil II was able to focus on his war with Bulgaria again. Samuel had extended his rule from the Adriatic to the Black Sea and raided into central Greece, and Basil was determined to reverse the fortunes of the empire. In 1001–1002, the Byzantines were able to reassert their control over Moesia, and in 1003 he raided into Macedonia, taking Skopje. In 1005, the governor of Durazzo surrendered his city to the Byzantines. During the next several years, the Byzantines failed to make any significant gains. Finally, on July 29, 1014, Basil II outmaneuvered the Bulgarian army in the Battle of Kleidion, with Samuel separated from his force. Having crushed the Bulgarians, Basil was said to have captured 15,000 prisoners and blinded 99 of every 100 men, leaving 150 one-eyed men to lead them back to their ruler, who fainted at the sight and died two days later suffering a stroke. Although this may be an exaggeration, this gave Basil his nickname Boulgaroktonos, "the Bulgar-slayer" in later tradition. Bulgaria fought on for four more years, but finally submitted in 1018. The victory over the Bulgarians and the subsequent submission of the Serbs fulfilled one of Basil's goals, as the empire regained its ancient Danube River frontier for the first time in 400 years. Before returning to Constantinople, Basil II celebrated his triumph in Athens. Basil II returned in triumph to Constantinople, then promptly went east and attacked the Persians over control of Armenia, which had become a Byzantine tributary when its king died in 1000. More victories followed, and Armenia rejoined the Byzantine empire for the first time in two centuries. Basil created in those highlands a strongly fortified frontier, which, if his successors had been capable, should have proved an effective barrier against the invasions of the Seljuk Turks. In the meantime, other Byzantine forces restored much of Southern Italy, lost to the Normans over the previous 150 years, to the empire's control. When Basil finally died on December 15, 1025, he was planning a military expedition to recover the island of Sicily. Basil was to be buried in the last sarcophagus available in the rotunda of Constantine I in the Church of the Holy Apostles. However, he later asked to his brother and successor Constantine VIII to be buried in the Church of St. John the Theologian (i.e. the Evangelist), at the Hebdomon Palace complex, outside the walls of Constantinople. The epitaph on the tomb celebrated Basil campaigns and victories. During the pillage of 1204, Basil's grave was ravaged by the invading Crusaders of the Fourth Crusade. Basil was a short, stocky man with ascetic tastes, who cared little for the pomp and ceremony of the imperial court, and typically held court dressed in military regalia. Still, he was a capable administrator, who unique among the soldier-emperors, left a full treasury upon his death. He was worshipped by his army, as he spent most of his reign campaigning with them instead of sending orders from the distant palaces of Constantinople, as had most of his predecessors. He lived the life of a soldier to the point of eating the same daily rations as any other member of the army. He also took the children of deceased officers of his army under his protection, and offered them sheltering, nourishment and education. Many of those children would later grow to become his soldiers and his officers, and came to think of him as a father. Besides being called the "Father of the Army", he was also popular with country farmers. This class produced most of his army's supplies and offered him most of his soldiers. To assure that this flow of supplies and men continued, Basil's laws protected small agrarian property and lowered their taxes. His reign was considered an era of relative prosperity for the class, despite the almost constant wars. On the other hand, Basil increased the taxes of the nobility and the church and looked to decrease their power and wealth. Though understandably unpopular with them, neither of them had the power to effectively oppose the army-supported Emperor. Basil never married or had children that we know of - a womanizer as a young man, Basil chose to devote himself fully to the duties of state upon becoming emperor. Unfortunately, this meant that he was succeeded by his brother and his family, who proved to be ineffective rulers. Nevertheless, 50 years of prosperity and intellectual growth followed because the funds of state were full, borders were not in danger from exterior intruders, and the empire remained the most powerful political entity of the Middle Ages. During the 20th century in Greece, interest for the prominent Emperor resulted in Basil becoming the subject of a number of biographies as well as historical novels. Arguably the most popular of them is Basil Bulgaroktonus (1964) by historical fiction writer Kostas Kyriazis (b.1920). Written as a sequel to his previous work Theophano (1963), focusing on Basil's mother, it examines Basil's life from his childhood till his death at an advanced age, through the eyes of three different narrators (all of them fictional). The first one is Areti Skylitzi, a girl from a noble family that John I brought to young Basil to be his friend and playmate. She becomes the confidant of his deepest thoughts and later the only woman that truly loves him. Basil can never marry her. Witnessing at an early age the murders of his father Romanos and step-father Nikephoros by Theophano, their wife, his mother, had traumatised him. He associates marriage, trust with death and murder. Areti stays by his side, as his unofficial consort, till his death. She alone hearing his private thoughts, filled often with self-doubt, sorrow, inner conflict while dealing with hard decisions. For Areti, Basil is her life-long consort, needing to be comforted. The second narrator is Nikolaos, one of Basil's generals. He has followed Basil's campaigns through his life, and witnessed his major battles and later his death. For him Basil was his leader, a lord to be respected and served, a "father" of his army. The third and last one is a Bulgarian, one of Samuel's generals. He spend most of his life serving his Tsar and fighting Basil. He tells their side of the long battle, that occupied almost forty years. For him Basil is the enemy, the slayer of his people, the man responsible for his own leader's death. Accurately describing the historical events and adding fictional to fill-in the blanks, it has been considered the best introduction to Basil and his age which a casual reader could have. It has been continuously reprinted since 1964. John Julius Norwich, "History of Byzantium". P.C. Ntelta, "The Age of the Bulgar-slayer" (In Greek), 1911, ESTIAS Publishing co.